When I heard there was another anime by the creator of Anohana called Nagi no Asukara in the works, I braced for another round of emotional masochism. But while still a story of loss and love, I was treated to a world under the sea that was as beautiful as it was thematically deep. Nagi no Asukara is set in a world where there are two races of humans, those who live on land and those who live in the ocean. But instead of living in caves or shipwrecks or the like, the people from beneath the waves live in houses like ours with streets like ours. Instead of a sky, they have the water refracting the sunlight. Instead of birds, fish swim through the “air” while sea slugs and crabs take the place of bugs. And while they don't have snow, occasional salt flakes fall in a similar way, coating the ground in white. This world so similar to our own yet so different looks beautiful in the anime and each time the characters go there it is a special treat. But the visuals aren't the only thing that makes the world of Nagi no Asukara so captivating. Rather, the whole world, while similar to ours, has one fundamental difference—the sea god. The tale of his life and the lore surrounding it sound like a traditional folk tale—though to the people in this world, it is history. Thus, the whole story of Nagi no Asukara acts as a modern folk tale—a continuation of a story from so long ago it has become myth. 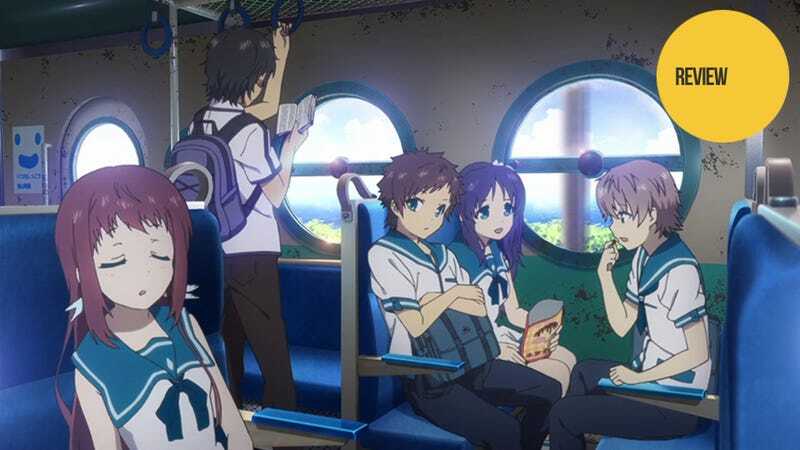 Much of the external conflict in Nagi no Asukara comes from one of the biggest problems that Japan is now facing—depopulation. Less children are born each year so schools close and the older population look for someone to blame. In the world of Nagi no Asukara, it’s easy for the sea humans to blame those on the land. This is because sea humans have a special membrane that allows them to breathe in the water. However, land humans lack this—as do half-breed children. Thus, when a sea person falls in love with a land human and wishes to be with them, they are banished. In other words, the sea humans see the land humans as “pigs” who steal their women and are the cause of their looming extinction. The land humans respond by seeing the sea humans as more “fish” than human creatures that live in backwards isolation. At the start of the series, four of the five main characters, a group of sea human children, share their parents' prejudice—after all, their school was closed down because of a lack of children, and now they have to go to the school on the surface. But after some growing pains, the children from both sea and land see each other as people—neither pigs nor fish. And thus the show becomes a battle of children's wisdom versus lifelong prejudice. But on the personal side of the conflict, this shift in the children’s viewpoint—the moment when they form opinions different from those of their parents—marks the first major step in the main characters' coming of age. As they enter adolescence, the children receive not only the ability to make their own choices, but also the challenge of confronting a slew of new emotions. While before they were happily innocent, now the four friends must deal with feelings of love, jealousy, guilt, and fear. Thus on the most basic level, Nagi no Asukara is a story about dealing with change, and moreover, the fear of change. This first half of the anime's 26 episodes deals with the five children attempting to cope with their emotions as they bridge the gap between their two cultures by performing a yearly ritual that the adults have called off because of rampant prejudice on both sides. At the same time, the living incarnation of the sea god has announced that the end of the world is coming; and only by going into undersea hibernation will anyone survive. Of course, only the sea humans can do this, leaving the land humans doomed to a slow apocalypse over the next generation as the planet freezes. The children, hoping the ritual will convince the sea god to help avert the disaster, perform the ritual even as their own parents enter a hibernation that could last centuries. The ritual does not go as expected and leaves three of the children missing, one being stranded on dry land without her friends or parents, and the undersea village cut off by an impassable current. The series then jumps five years ahead to show the consequences of the children's actions. The world is freezing, Chisaki (the remaining sea child) and Tsumugu (the land child) have grown up, and the supporting characters who were young children have become the age that the main characters were at the start of the series. But then, just as they establish a new status quo, the missing children appear one-by-one having aged not even a day in five years. This gives the series a plethora of new dramatic possibilities which it is more than happy to explore. Chisaki must deal with the guilt of making a new life for herself while at the same time coming to terms with her childhood love and jealousy. The supporting characters now move into becoming lead characters in their own right as they deal with their own coming of age issues. Meanwhile, the original five children's old interpersonal dilemmas come to a head amidst the new, dynamic relationships between the characters. Best of all, even with a main cast of seven, no character is left underdeveloped or without a resolution of his or her own. When it comes down to it, the goal of Nagi no Asukara's second half is to undo the changes that happened in the first half in both the characters' respective relationships and the world at large. As stated above, the changes are a setup rife with dramatic possibilities that the anime does a great job at exploring. Unfortunately, the characters succeed at this goal of reversal for the most part. While it does make for a happy ending, it also undercuts the main theme of the anime: learning to deal with change and the fear of change. The world is saved and friendships are basically rebooted to how they were at the start of the show. Moreover, even those few with major changes that can't be undone find a greater happiness than they had at the beginning and are arguably better off. In the end, there are no lasting negative changes that anyone has to deal with which is painfully unrealistic in the world presented in the story. The biggest problem with Nagi no Asukara is its repeated conflicts and lack of meaningful resolutions—especially those of the first half. For example, Hikari's sister Akari falls in love with a man on the surface. When she decides to take exile from her home and marry him, everything seems resolved. Yet, the conflict between her father and her still eats up time each episode as the marriage nears despite nothing changing. The ofunehiki ritual and its preparation are even worse: The children decide to do the ritual on their own but their hand-made wooden sacrifice is destroyed. So they make it again and ask the adults for help with the ritual. The wooden offering is destroyed again and since the adults decide not to help, the kids decide to do it on their own again. In other words, for several episodes in the middle of the first half, the series does nothing but tread water. Nagi no Asukara is a visually stunning fantasy that is built to play on your emotions. It succeeds as a coming of age story and its thematic exploration of growing up and dealing with change is well-executed. While it is a little unsatisfying in the end, the series' only real problem is the few episodes where everything grinds to a halt and nothing is furthered in the plot or the themes—where it all feels like the world is just killing time before the climax. And while it never manages to reach the same emotionally devastating level as Anohana, it is nonetheless an anime worth watching for anyone who enjoys modern fantasy, romance, or coming of age tales. Nagi no Asukara aired on Tokyo MX in Japan. It can be seen for free and with English subtitles in the US on Crunchyroll and Hulu.